A new chapter in the relationship between Northern Ireland and China got underway today with the official launch of the Confucius Institute at the University of Ulster (CIUU). Northern Ireland’s only Confucius Institute formally came into being with a colourful opening ceremony in Jordanstown attended by China’s most senior female politician Madame Liu Yandong, Northern Ireland’s First Minister Peter Robinson, Deputy First Minister Martin McGuinness and University of Ulster Vice Chancellor Professor Richard Barnett. 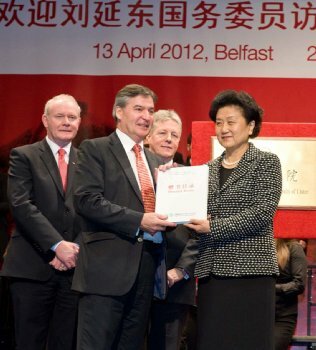 The event, which featured Chinese and Irish music and dancing, Chinese calligraphy and bagpipe playing, was attended by Employment and Learning Minister Dr Stephen Farry, Junior Ministers Jonathan Bell and Martina Anderson and over 150 prominent figures from education, business and politics in Northern Ireland and China. University of Ulster Vice Chancellor Professor Richard Barnett said the setting up of the CIUU was a significant milestone in Northern Ireland and Chinese relations. “The University of Ulster was delighted last year when theChinese Ministry of Education’s Council for the Chinese Language, Hanban, chose our bid to establish Northern Ireland’s only Confucius Institute,” he said. “Since then, the University has enjoyed a fruitful relationship with our partner university in south east China, Zhejiang University of Media and Communication and we are excited at the possibilities this initiative opens for students and staff in both countries but also wider society. “Confucius Institutes not only promote the teaching of Chinese language and culture but facilitate the training of language teachers, cultural and academic exchanges and research into China’s education system, economy, the arts and society. “In doing so, they have become a vital cog in the relationships China builds with the countries in which they operate. “We are deeply honoured that Madam Liu is here today to launch the Institute, which marks a major stage in the work of the university and its role as a global establishment of learning, the First Minister, Mr Robinson, said. “We want to build closer relationships with the government and people of China and the Confucius institute will assist us greatly by enabling us to learn more through cultural and academic exchanges and research. “The availability of short courses and evening classes which will be offered through the Confucius institute will provide opportunities for our people to learn more about China and its people and culture. "On behalf of the Chinese government and the Confucius Institute headquarters, I wish to extend my warm congratulationsonthe establishment of the Confucius Institute at the University of Ulster, and extend sincere greetings and best wishes to the staff and students here. "This year marksthe 40th anniversary of the establishment of diplomatic relations at ambassadorial level between China and the United Kingdom. Over the past four decades, UK-China relations have been moving forward in great depth. We have established acomprehensive strategic partnership, and enjoy all round cooperation. "An important purpose of my visit to the UK is to implement the agreement between premier Wen Jiabao and Prime Minister Cameron to establish China-UK high-level people-to people dialogue. "This is the first people-to-people exchange mechanism China has established with an EU country, and the third it has established, after the USA and Russia,. "I chose Northern Ireland as the first stop of my visit to the EU in order to fully demonstrate China’s commitment to Northern Ireland. " During her visit, Madame Liu announced that 25Ulster students would visit China this summer as part of Chinese language summer camp programme and that the Chinese Government is to fund 10 scholarships for Northern Ireland students to study in China. She also presented the University with 500 Chinese textbooks and software suites.